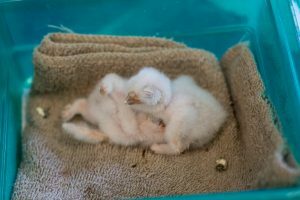 With spring arriving, so has baby season come to the Medina Raptor Center! As Great Horned Owls are some of the first nesters of the year, we currently have an influx of seven of these babies that are all in various fledgling stages. Fledgling is a stage in a bird’s life when they are growing their flight feathers and beginning to venture out of the nest. At this point in their lives, they are not flying on their own and their parents are still bringing them food, but the nest has become crowded so they do a lot of exploring on the branches around them. They’ll use their developing feathers to give them a little boost as they hop from branch to branch, and they are not very graceful or coordinated while they do this. It’s during this stage that we often get calls about babies that are down on the ground. What is often misunderstood is that these babies aren’t necessarily as helpless as we fear–the parents are around somewhere keeping an eye on their young, and these fledglings will use their beaks and talons, along with their awkward jumping ability, to get themselves back up tree to their parents. In most cases, if the baby is left alone during this time, it is much better off finding its way back up a tree to the parents. When we get calls about babies on the ground, we will often ask a lot of questions to determine things such as how long the bird has been on the ground, if the parents have been seen or heard, and if the bird is mobile and moving around. However, sometimes fledging doesn’t always go well and babies do get hurt during this stage. 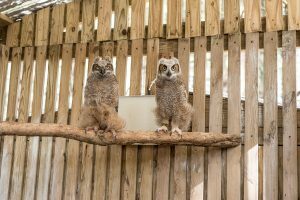 That’s where the Medina Raptor Center steps in to take care of these babies, providing them with all the care and attention they need to get better and be released back into the wild. In addition to all of the Great Horned Owl babies, we also have a pair of Eastern Screech Owls that came to us because the tree where they were living had been cut down. These owls are the youngest we have ever received a the Center and our volunteers are w orking around the clock to give them all the food they need to get big and strong. This care is important because all raptors are born altricial, or helpless. They rely on the parents to provide them with warmth and food. These babies could barely move themselves around because their legs could not yet support their tiny weight. The other concern we have when we have babies come in this young is that they will become imprinted on humans. Imprinting is when a bird (or animal) identifies with the first thing they see or hear. If a bird imprints on a human, this means we can’t release them to the wild because they may not be afraid of humans, they might not hunt for themselves or be able to reproduce. When babies come in this young, we are take extra measures to prevent imprinting–this means no talking in the hospital, we play the sounds and calls of the baby’s species, and any time we come in contact with the babies, we wear camouflage, masks and gloves to prevent the bird from associating anything with humans. 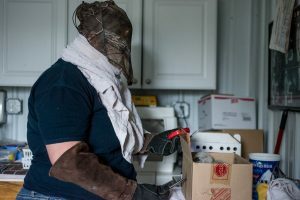 The ultimate goal of rehabilitation is to release the bird back to the wild so that it can hunt and reproduce, so all of the measures we take is to give the birds in our care that best possible chance. As the raptors begin to have their babies, the ducks and geese in the area have already laid their eggs and their ducklings and goslings are hatched and following around their parents. Where raptors are born helpless, waterfowl are precocial, which means that upon hatching, they can begin swimming and eating on their own. They do stay with their parents, however, following them to a source of water. So what do you do if you find a baby? We have some wonderful information found here on what to do if you’ve found a baby or an injured bird. And if you’re not sure what to do, you can always call us and we will be happy to provide advice on the best thing to do for the animal.